SweetRush was a top overall winner at the prestigious 2018 Brandon Hall Excellence Awards. The company earned 21 honors including 13 Golds in a wide range of categories, a remarkable validation of its versatility and commitment to excellence. 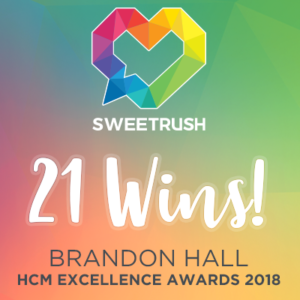 SweetRush Wins 21 Awards At 2018 Brandon Hall Excellence Awards, 13 Golds! San Francisco, Calif., August 23, 2018 — The Brandon Hall Group bestowed 21 Brandon Hall Excellence Awards, including 13 Gold awards, to SweetRush, recognizing the company as a leader in performance improvement, custom learning development, and learner engagement. SweetRush, one of the top overall winners for the year, shares these recognitions with client-partners Cisco, Sika, Bridgestone, Deloitte, Hilton, Google, and Mondelez. SweetRush’s versatility and commitment to innovation was on full display during the awards announcement, as the company earned top honors in numerous categories—including Gold awards in categories such as Best Advance in Custom Content, Best Use of Mobile Learning, and Best Learning Team, and three Golds in Best Unique or Innovative Learning Program, among many others—proving SweetRush’s capabilities and high standards in developing custom learning solutions. In 2017, SweetRush won a similar array of accolades. SweetRush’s focus on excellence and commitment to clients and craft, coupled with its caring culture have created a winning formula that has resulted in a world-class client roster and the delivery of highly effective learning solutions. The competition’s judges were independent senior industry experts and Brandon Hall Group senior analysts and executive leadership, who evaluated the entries based on the following criteria: fitting the need, design of the program, functionality, innovation, and overall measurable benefits. For the complete list of winners, visit the Brandon Hall Group website. Congratulations to all the winners! SweetRush is trusted by many of the world’s most successful companies to help them improve the performance of their employees. We are known for exceptionally creative and effective solutions that combine the best of Instructional Design with highly engaging delivery. Our work has earned a long list of awards and accolades in collaboration with our clients. Discover more at our website. SweetRush’s focus on excellence and commitment to clients and craft, coupled with its caring culture have created a winning formula that has resulted in a world-class client roster and the delivery of highly effective learning solutions.